TheGunBlog.ca — A new group of Canadian doctors backed by the country’s main medical organizations is urging the government to ban and seize guns from federally licensed hunters, farmers and sport shooters. Its leader compared new restrictions to a “preventative vaccine” against a disease. 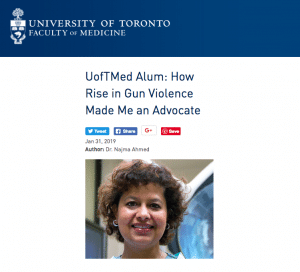 “No civilian needs access to guns,” Najma Ahmed, the activist behind Canadian Doctors for Protection From Guns, said Jan. 15 on Twitter. Ahmed is a trauma surgeon at Saint Michael’s Hospital in Toronto who worked to save gunshot victims after July’s attack on Danforth Avenue. She blocked TheGunBlog.ca (@TheGunBlog) from seeing what she writes on Twitter on Jan. 8 after we retweeted another of her posts with a comment. The group Ahmed is spearheading seeks new prohibitions and “an amnesty program to recover firearms currently in circulation,” according to its position statement. The doctors support Bill C-71, the government’s planned law against men and women with police-authorized firearm licences. Hunting is at the heart of Canadian culture, and target shooting is one of the country’s safest and most-popular sports. More men and women have a firearm licence than play golf, hockey, football, tennis or who ski. In addition to the country’s record high of 2.2 million permit holders, millions more family and friends of all ages hunt and shoot safely and responsibly under their supervision. The Danforth attacker — who ignored the handgun ban that applied to him — didn’t send more shredded bodies to Ahmed because he was stopped by police who shot back. The murderer then killed himself. Almost 100,000 men and women, mainly police, are authorized or required to carry loaded guns every day to protect the public, including doctors campaigning to disarm them and their families. Senior police leaders oppose new bans. All guns are banned already for everyone under threat of prison unless they get police or military permission. Civilians must pass safety courses, tests, reference checks and a daily background check. Success for Ahmed would end the athletic careers of Lynda Kiejko, an Olympic pistol shooter, and her fellow competitors on Team Canada. It would prevent farmers from protecting their crops, and cause communities who depend on hunting to starve. Update April 6: Ahmed’s group registered with Canada’s Commissioner of Lobbying using the address and phone number of St. Michael’s Hospital. “Physicians and health workers from across Canada will be holding a National Day of Action in communities from coast to coast on April 3rd, 2019 to call for stronger gun control laws, including passage of Bill C-71 and a handgun assault weapons ban,” the group said. Great call this evening with leaders from across the country – getting ready to launch advocacy group – Canadian Doctors for Protection from Guns. Ahmed began her campaign against Canada’s most-lawful demographic in mid-November as the Coalition for Gun Control kicked off a new disarmament effort. Nov. 15: Opinion article in the Globe and Mail. Nov. 20: Tweet Coalition for Gun Control disarmament campaign. Jan. 28: Facebook page, initially using Ahmed’s Twitter photo. Jan. 30: Global News profile. Jan. 31: Article at University of Toronto Faculty of Medicine, where Ahmed is a professor and vice-chair in the Department of Surgery. About zero people die each year at Canada’s 1,400 shooting ranges. That compares with more than 30,000 annual deaths by doctor error, the Huffington Post reported in October 2015, before the current opioid epidemic. “Patients suffered potentially preventable harm in more than 138,000 hospitalizations in Canada, or about 1 in 18 hospitalizations,” the Canadian Institute for Health Information said in October 2016. Canadian shooters face their biggest threat in a generation as the government examines new firearm prohibitions beyond those in Bill C-71. It’s also looking to ban home firearm storage. Yet most firearm owners refuse to support gun-rights groups or media. They keep quiet or bicker with each other online while prohibitionists work together on media campaigns and elect allies into power. Many gun owners vote for anti-gun candidates and parties, such as the current government. Invite your doctor to the range.